Sleeping Beauty is dressed for the royal ball! Sensational Disney Showcase Aurora Masquerade Statue! From Enesco's stunning Disney Couture de Force collection. Her mask depicts the sleepy night moon and dazzling stars! Enesco's stunning Disney Couture de Force collection celebrates the mystery and enchantment of a royal masquerade ball, where Disney's reigning princesses and vampy villains mingle in delight, embellished in haute couture. No detail is overlooked, from faux jewels to opalescent paints that bring this Sleeping Beauty sculpture to life. 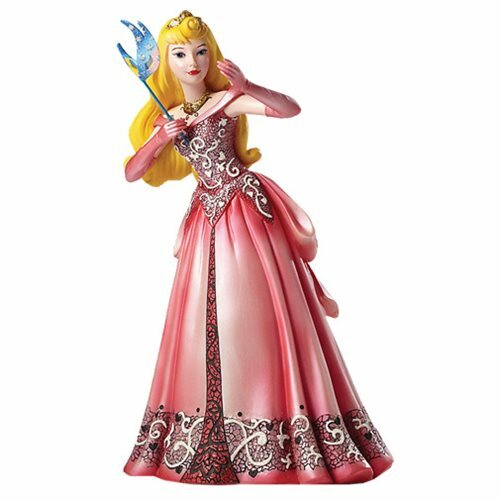 In this sensational Disney Showcase Aurora Masquerade Statue, Sleeping Beauty stands 8 1/8-inches tall as she hides behind her mask depicting the sleepy night moon and dazzling stars! Ages 15 and up.